Yesterday morning we assessed a dog named Hoda. 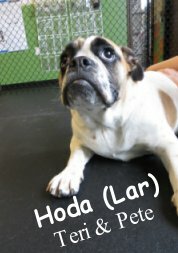 Hoda is a 48-pound, 8-month-old, Old English Bulldog & French mix. She came in beaming and ready to explore Fort Fido. She entered into medium roll curiously sniffing about. Hoda began to meet some other pups in medium roll and had a great time socializing with the other dogs. Hoda began to play with Cooper, Maggie, and Petey (Take a peek below!) after learning that The Fort is a safe place to play and have fun. Hoda definitely enjoyed her time here today and we look forward to seeing her return for some more fun.